Minnesotan Matt Liebsch, 28, of Team Strong Heart was a man in a hurry last weekend. The married father of two from Orono was a late entry in the 37th annual SWIX Boulder Mountain Ski Tour staged Saturday, Feb. 4 on a 32-kilometer course north of Ketchum. Yet Liebsch, a 2006 University of Minnesota graduate who won the 2009 American Birkebeiner, was anything but late in winning back-to-back Nordic races Saturday and Sunday on courses 1,387 miles apart. Three-time Vasaloppet USA king Liebsch, an expert ski technician, figured out a way to have what he called "rocket skis," on the cold and grabby snow that challenged the leaders of Saturday's Boulder Ski Tour. He led all 714 finishers with a time of 1.13:34, 13 seconds ahead of the chase group. Liebsch packed his bag, left the Hailey airport mid-afternoon and returned to Minneapolis. There, at Wirth Park he made another huge withdrawal from his impressive fitness bank by winning Sunday's 10th annual City of Lakes Loppet in 37:06 on a weather-shortened 17k (10.5-mile) freestyle course—reduced from its 33k (20.5-mile) layout. He was unstoppable all weekend, especially in his first Boulder Ski Tour Saturday. And it wasn't an easy ski. Race announcer Travis Jones called it "a long, cold day," characterized by squeaky slow snow for the Elite leaders that made them work hard to keep their skis gliding along the route from Galena Lodge to the SNRA headquarters. Liebsch said, "I skated hard on one of the last downhills, got away and just kept going. I went a ways out ahead and didn't expect to hold it. But when I got them up to speed, my skis were fast enough." It's been a solid year for Independence Day baby Liebsch, a full-time staff member for Gear West in Long Lake, Minn. who trained with his daughter in a backpack, when she was small and weighed 20 pounds. He started skiing at age 16, won the Vasaloppet three times from 2009-11 and became the first U.S. racer in 17 years to win the 52k American Birkebeiner, in 2009. 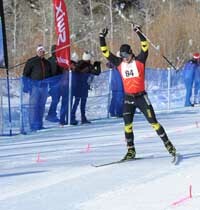 He was this year's silver medalist in the 15k national skate race in Maine. The parental responsibilities didn't hold Liebsch back in winning the $1,500 top prize. Neither did it prevent mother-of-three Rebecca Dussault, 31, out of Gunnison, Colo. from capturing her third Boulder women's title with a 1.18:13 time, good for 20th place just a leg faster than 25-year-old Morgan Arritola of Ketchum. It wasn't a course that fit Arritola's hill-climbing strengths. Nevertheless Arritola (1.18:14) was second just ahead of Sun Valley Ski Education Foundation teammate Chelsea Holmes (1.18:15) in a very tight four-woman pack. All age class champions received complimentary entry to the 2013 Boulder Tour. From the Wood River Valley, those class winners were Kaitlyn Landis, Alexa Turzian, Brooke Hovey, Morgan Arritola, Elizabeth Youngman, Katherine Nalen, Linda McClatchy, Gabriele Andersen, Del Pletcher, Grace Dyck, Andy Andrews, Shauna Thoreson and Charley French. In addition, JoAnn Levy, 71, finished her 37th Boulder Ski Tour. Check the Feb. 15 Local Life for more Boulder photos. February 4, 2012, the 37th annual 32-kilometer (19.8-mile) cross-country ski tour. The course started at Senate Creek near Galena Lodge Touring Center 23 miles north of Ketchum and ended at the Sawtooth National Recreation Area headquarters 8 miles north of Ketchum. Of 714 racers who finished the 32k course—56 fewer than last year—432 were male and 282 female. Senior racers were Charley French, 85, of Ketchum and Shauna Thoreson, 78, of Ketchum. Youngest were Sydney Palmer-Leger, 10, of Park City, Utah and Abby Swanson, 10, of Salt Lake City, Utah. Of the 714 finishers, 156 or 22% of the total field listed Wood River Valley addresses, meaning 78% came from out of the valley. Finishing times of the locals who completed the course are listed by age class in hours, minutes and seconds. Age after each racer's name. Complete results at bouldermountaintour.com. 1—Rebecca Dussault, 31, Gunnison, Colo. 1.18:13.8 (20th overall). 2—Morgan Arritola, 25, Ketchum 1.18:14 (21st overall). 3—Chelsea Holmes, 25, Ketchum 1.18:15 (22nd). 4—Evelyn Dong, 26, Park City, Utah 1.18:19. 5—Nicole DeYong, 29, Ketchum 1.20:18. 6—Alexa Turzian, 23, Hailey 1.21:42. 7—Brooke Hovey, 39, Ketchum 1.21:44. 8—Rosie Brennan, 23, Park City 1.21:54. 9—Kristen Monahan, 24, Ketchum 1.27:16. 10—Emma Garrard, 30, Park City 1.27:20. Podium: 1—Shauna Thoreson, 78, Ketchum 3.00:38. 2—Joanne Davis, 75, Sun Valley 3.11:38. Podium: 1—Grace Dyck, 70, Hailey 1.53:12. 2—JoAnn Levy, 71, Sun Valley 3.44:27. Podium: 1—Gabriele Andersen, 66, Sun Valley 1.49:11. 2—Dagmar Eriksson, 66, Bend, Ore. 1.53:09. 3—Audrae Coury, 69, Big Sky, Mont. 2.11:40. Also: 4—Carol Monteverde, 65, 2.12:37. 5—Jenny Busdon, 69, 2.14:31. Podium: 1—Linda McClatchy, 62, Hailey 1.48:55. 2—Janet Conway, 61, Alta, Wyo. 1.50:36. 3—Sally Elliott, 63, McCall 1.57:21. Also: 9—Cindy Phelan, 60, 2.37:14. 10—Diana Wadsack, 64, 2.48:20. 11—Ann Scales, 64, 2.54:54. 12—Jan Wygle, 61, 3.05:11. Podium: 1—Kathleen Nalen, 55, Ketchum 1.35:32. 2—EJ Harpham, 55, Bellevue 1.40:56. 3—Jane Linville, 55, Victor 1.43:43. Also: 6—Victoria Wiseman, 58, 1.50:17. 9—Charlotte Alexander, 59, 1.55:43. 10—Carol Mutzel, 59, 1.58:42. 16—Francette Labatut, 58, 2.23:00. 18—Sara Gorham, 57, 2.29:01. 23—Paula Perry, 57, 3.21:44. Podium: 1—Elizabeth Youngman, 52, Sun Valley 1.27:34. 2—Adrienne Leugers, 52, Hailey 1.27:35. 3—Muffy Ritz, 54, Ketchum 1.32:48. Also: 5—Kelly Allison, 50, 1.36:30. 6—Kim Kawaguchi, 50, Vancouver, B.C., Canada 1.37:32. 8—Robin Potts, 50, 1.38:03. 9—Susan Thoreson, 51, 1.40:59. 10—Sue Engelmann, 53, 1.42:39. 11—Joyce Allgaier, 54, 1.43:01. 14—Zelda Zahir, 53, 1.46:14. 23—Brenda Spackman, 54, 1.58:22. 24—Joney Otteson, 51, 1.58:43. 29—Patricia Klahr, 54, 2.03:19. 34—Lucy Bourret, 50, 2.05:55. 35—Kelly Martin, 50, 2.08:22. 36—Sue Conner, 51, 2.08:24. 39—Lynn Chaldu, 52, 2.14:12. 44—Deb Cornwell, 54, 2.23:26. 48—Laura Hubbard, 50, 2.39:25. 49—Shirleen Coleman, 50, 2.49:36. Podium: 1—Mia Stockdale, 47, Vail, Colo. 1.30:02. 2—Roxanne Toly, 49, Park City 1.31:29. 3—Tanya Swenson, 48, Park City 1.33:56. Also: 5—Tricia Swartling, 46, 1.34:42. 14—Gretchen Flint, 48, 1.48:17. 17—Eva DeWolfe, 47, 1.56:34. 19—Lisa Mary, 49, 2.01:33. 27—Ellen Gillespie, 47, 2.23:00. Podium: 1—Mary Wellington, 41, Bend, Ore. 1.28:14. 2—Liv Jensen, 40, Hailey 1.31:12. 3—Michelle Jensen, 42, Boise 1.32:45. Also: 18—Tizz Miller, 43, 1.44:19. 22—Liz Mitchell, 44, 1.50:45. 23—Janelle Conners, 43, 1.51:37. 24—Cameron King-Randolph, 41, 1.53:08. 25—Kendall Lutz, 40, 1.54:22. 26—Kirsten Ritzau, 44, 1.55:31. 35—Courtney Gilbert, 41, 2.01:18. 39—Kristina Kind, 44, 2.12:43. 41—Veronique Forgeat, 42, 2.24:43. 44—Mia Toby, 44, 2.42:13. Podium: 1—Brooke Hovey, 39, Ketchum 1.21:44. 2—Sarah Max, 37, Bend, Ore. 1.27:20. 3—Jessica Jensen, 37, Boise 1.33:38. Also: 8—Martha Pendl, 39, Alta, Wyo. 1.44:41. 10—Berit Campion, 37, SLC 1.48:00. 15—Sarah Torres, 38, 2.10:03. 16—Michelle Sewell, 35, 2.27:01. 19—Anna Svidgal, 39, 2.50:15. Podium: 1—Rebecca Dussault, 31, Gunnison, Colo. 1.18:13.8. 2—Emma Garrard, 30, Park City 1.27:20. 3—Casey Collins, 30, Bend, Ore. 1.37:42. Also: 5—Jessica Wasilewski, 32, 1.38:31. 6—Cortney Vandenburgh, 34, 1.41:10. 8—Trina Benson, 31, 1.43:08. 9—Hannah Young, 34, 1.43:44. Podium: 1—Morgan Arritola, 25, Ketchum 1.18:14. 2—Chelsea Holmes, 25, Ketchum 1.18:15. 3—Evelyn Dong, 26, Park City 1.18:19. Also: 4—Nicole DeYong, 29, 1.20:18. 5—Ashley McQueen, 27, 1.27:21. 7—Abbie Harris, 29, 1.27:25. 8—Amy Ostrofe, 25, 1.28:52. 11—Laura Theis, 29, 1.39:14. 12—Lexie Praggastis, 25, 1.39:39. 14—Trixie Skialot, 29, 1.42:49. 17—Katherine Bridwell, 29, 2.03:25. City 1.21:54. 3—Kristen Monahan, 24, Ketchum 1.27;16. Podium: 1—Kaitlyn Landis, 17, Hailey 1.39:31. 2—Mariah Bredal, 14, Victor 1.40:17. 3—Annie Jarvis, 14, Bend, Ore. 1.57:50. Podium: 1—Katy Bonacci, 13, Salt Lake City 1.35:21. 2—Sydney Palmer-Leger, 10, Park City 1.57:24. 3—Madison Morgan, 13, Park City 2.04:23. 1—Matthew Liebsch, 27, Orono, Minn. 1.13:34.7. 2—Lars Flora, 34, Anchorage, Ak. 1.13:47.1. 3—Nils Koons, 23, Augusta, Maine 1.13:47.5. 4—Dylan McGuffin, 23, Craftsbury Common, Vt. 1.13:48. 5—Matt Gelso, 23, Ketchum 1.13:53. 6—Leif Zimmerman, 28, Bozeman, Mt. 1.14:41. 7—Ian Murray, 33, Canmore, Alberta, Canada 1.14:57. 8—Oliver Burruss, 25, Bend, Ore. 1.14:58. 9—Tim Reynolds, 25, Craftsbury Common, Vt. 1.15:39.0. 10—Kevin Bolger, 18, Ketchum 1.15:39.5. Podium: 1—Charley French, 85, Ketchum 2.27:09. Podium: 1—Tim Carter, 76, Granby, Colo. 1.49:39. 2—David Ayarra, 76, Bend, Ore. 2.29:24. 3—Tom Frey, 76, Kingston, Wash. 2.33:38. Also: 4—Ted Angle, 75, 2.37:35. 5—William Pryor, 77, 3.31:59. Podium: 1—Andy Andrews, 70, Hailey 1.37:51. 2—Raliegh Jensen, 71, Boise 1.55:20. 3—Peter Maier, 71, Ketchum 2.02:29. Also: 4—Mel Dyck, 70, 2.10:29. 6—Sam East, 71, 2.16:13. Podium: 1—Del Pletcher, 67, Sun Valley 1.27:43. 2—Tim Schuld, 66, Boulder, Colo. 1.37:31. 3—Robert Disbrow, 68, Vancouver, B.C., Canada 1.41:30. Also: 4—Tullio Celano, 69, 1.49:36. 8—Edward Flood, 66, 2.04:37. 9—Roger Miller, 68, 2.10:55. 10—Karl Wadsack, 66, 2.11:48. 13—Carl Bontrager, 66, 2.24:43. 18—Mike Penrose, 65, 2.31:28. 20—Tom Campion, 69, 2.35:56. 21—Bob Buck, 66, 2.43:51. Podium: 1—Tom Noaker, 62, Oakley, Utah 1.26:56. 2—Leigh Mallory, 60, Colchester, Vt. 1.32:15. 3—Ralph Johnson, 63, Truckee, Ca. 1.33:40. Also: 5—Pat Simpson, 60, 1.35:32. 8—Craig Phelan, 60, 1.39:01. 14—Matt Gervase, 62, 1.45:19. 16—Jim Bradford, 60, 1.49:11. 20—Jay Hagenbuch, 60, 1.50:51. 22—Edward Miller, 64, 1.52:59. 35—Steven Beck, 61, 2.07:45. 39—Marshall Peterson, 64, 2.39:31. 40—Olav Ruud, 62, 2.50:19. Podium: 1—Donald Bauder, 59, Bigfork, Mt. 1.23:53.0. 2—Randy Beckner, 59, Helena, Mt. 1.23:53.3. 3—Rich Gross, 57, Bend, Ore. 1.27:54. Also: 8—Jim McClatchy, 59, 1.30:46.9. 9—Richard Knoebel, 58, 1.33:43. 15—Jon Holmquist, 59, 1.39:04. 16—Rob Landis, 55, 1.40:00. 18—Sigi Vogl, 59, 1.40:02. 22—Tom Pomeroy, 59, 1.41:51. 23—Jim Galanes, 55, 1.43:01. 32—Keith Perry, 57, 1.55:45. 33—James Keller, 59, 1.56:29. 37—Chris Puchner, 58, Fairbanks, Ak. 2.02:11. 48—Keith Sivertson, 58, 2.54:05. Podium: 1—Barry Makarewicz, 50, Salt Lake City 1.19:33. 2—Jon Engen, 54, Ketchum 1.20:27. 3—Odd Bersvendsen, 53, Jackson, N.H. 1.21:17. Also: 6—Kris Thoreson, 54, 1.23:53. 10—Jim Santa, 51, 1.28:12. 35—Craig Delagardelle, 50, 1.47:57. 40—Andrew Hawley, 54, 1.51:50. 45—Terry Duran, 52, 1.57:27. 52—John Kanellitsas, 50, 2.14:06. Podium: 1—Scott O'Brien, 49, Wilson, Wyo., 1.22:53. 2—Randy Anderson, 47, Pocatello 1.22:56. 3—Joe Dengler, 46, Truckee, Ca. 1.23:51. Also: 11—Jeff Ford, 46, 1.28:10. 14—Mike Wolter, 46, 1.32:26. 15—John Tormey, 45, 1.32:27. 19—Chris Williams, 47, 1.36:17. 22—Lee Melly, 48, 1.37:31. 30—Billy Nixon, 45, 1.43:48. 31—John Baker, 48, 1.44:06. 33—Blase Reardon, 48, 1.44:45. 36—Juerg Stauffacher, 45, 1.47:36. 41—James Gillespie, 48, 2.07:57. Podium: 1—Nathan Schultz, 40, Boulder, Colo. 1.16:14. 2—Jason Travis, 42, Park City 1.17:36. 3—Brian Frykman, 41, Bozeman, Mt. 1.21:31. Also: 6—Wilhelm Northrop, 42, Boise 1.25:53. 27—Mike Stevens, 43, 1.37:22. 28—Matthew Lutz, 41, 1.39:21. 29—John Kurtz, 42, 1.40:50. 37—Eric Huus, 41, 1.47:52. 43—Chris Bigelow, 44, 1.55:22. 44—Erik Boe, 41, 1.57:05. 45—Dave Keir, 43, 2.11:31. 46—Jim Keating, 41, 2.13:09. Podium: 1—Joseph Jensen, 38, Boise 1.19:15. 2—Samuel Cordell, 37, Mt. Hood, Ore. 1.20:15. 3—Kirk Howell, 37, Calgary, Alberta, Canada 1.20:18. Also: 7—Sam Young, 35, 1.25:18. 10—Travis Vandenburgh, 36, 1.27:09. 16—Ben Young, 37, 1.37:51. 29—David Riemann, 39, 2.16:40. Podium: 1—Lars Flora, 34, Anchorage, Ak. 1.13:47. 2—Ian Murray, 33, Canmore, Alberta, Canada 1.14:57. 3—Kurt Wolf, 31, McCall 1.15:45. Also: 27—David Wright, 31, 1.49:12. 31—Bryan Bridwell, 33, 2.10:09. 32—Sam Turner, 31, 2.20:48. Podium: 1—Matthew Liebsch, 27, Orono, Minn. 1.13:34. 2—Leif Zimmerman, 28, Bozeman, Mt. 1.14:41. 3—Oliver Burruss, 25, Bend, Ore. 1.14:58. Also: 7—Chris Mallory, 29, 1.19:35. 10—John Reuter, 27, 1.21:39. 11—David Vanderpool, 25, 1.23:43. 12—Jedd Young, 29, 1.24:38. 17—Peter Webb, 29, 1.33:38. 18—Bradley Guss, 27, 1.37:51. 27—Keith Anspach, 29, 2.09:03. Podium: 1—Nils Koons, 23, Augusta, Maine 1.13:47. 2—Dylan McGuffin, 23, Craftsbury Common, Vt. 1.13:48. 3—Matt Gelso, 23, Ketchum 1.13:53. Also: 4—Kevin Bolger, 18, 1.15:39. 14—William Spiller, 19, 1.20:57. 17—Scott Phelan, 21, 1.23:23. Podium: 1—Landon Beckner, 15, Helena, Mt. 1.20:27. 2—Kurt James Bruns, 17, Salt Lake City 1.20:59. 3—Fischer Gangemi, 17, Columbia Falls, Mt. 1.22:54. Also: 8—Thomas Gillespie, 14, 1.34:54. Podium: 1—Wilson Battle, 13, Salt Lake City 1.39:32. 2—Drew Palmer-Leger, 12, Park City 1.39:43. 3—Zach Williams, 12, Ketchum 1.42:09. Also: 4—Peter Wolter, 13, 1.45:20. 6—Lukas DeWolfe, 13, 1.56:31.